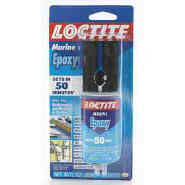 Epoxy Adhesives, from Loctite®, is quick drying and convenient to apply. Provides a high-strength waterproof seal that resists solvents. Can be used on most common materials such as tile, metal, ceramics and more. Can be used on most common materials such as metal, ceramics, fiberglass, tile, etc.